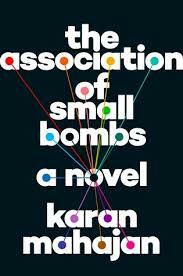 a book chick: "The Association of Small Bombs"
my take: Doesn't this cover look kind of fun? Strings and colorful dots! Lower case letters! Do not be taken in. The bombs referenced in the title are the real deal. The characters in the novel are forever changed by a terrorist bomb in a marketplace in Delhi. We see the story from all points of view ... the parents of the victims, the survivor and his parents, the bomb makers, the activists. Each of their lives is intimately entangled with each other's though they can not see their connections. Written in a style that mimicked the imprecision of bombings in the shrapnel that imbeds itself into both the body and the psyche. A little chaotic, random, penetrating, hidden. This writing style reminded me of Let the Great World Spin in which all the words and stories felt like they were spinning out of control. In this case, it feels like the words flying off the page, scattering and leaving marks. I found this book incredibly difficult to read because it hit too close to home: the actions taken by a few causing lasting damage to those within its perimeter. As the actual bombs explode in the novel, political bombs were detonating in real life. I felt battered by both. my verdict: Worth a read. Maybe in a sunnier month. Bombs, January, India ... what was I thinking? Oh yes, I would have picked this up based on the front cover design. And then would have put it right back down after reading the blurb on the back cover. Does not sound like something I need to read in January (especially this particular January), but I'll have to remember for when the sun comes back out.